A well-executed, thought-provoking diatribe on the proposed future of local arts. As an “arts festival for the future”, experimental theatre company Emergency Stairs’ Southernmost – One Table Two Chairs Project 2018 naturally chooses to buck the trend of a typical arts festival, acting a critique of the usual and taking on an artist-driven, process-centric approach, comprising primarily of workshops, demonstrations, open forums, and a single festival production. Similar to last year’s edition, this year’s production, Journey to Nowhere, continues to build on dialogues of cultural exchange and its future, but this time around, brings all seven participating artists and Emergency Stairs artistic director Liu Xiaoyi together to create a single work, more focused and fiercely urgent than last year’s triple bill showcase. 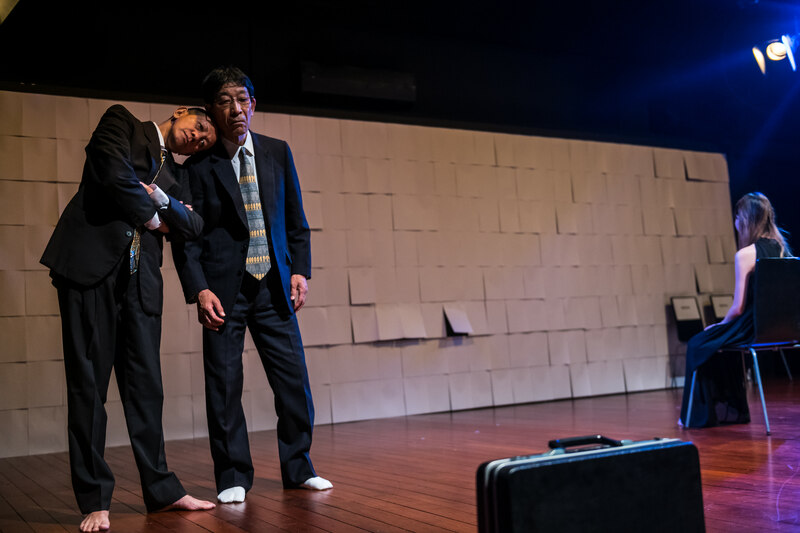 Titled Journey to Nowhere, the production was staged in Centre 42’s Black Box, with a limited seating capacity of about 30 audience members. Seven chairs in the front row are labelled with a ‘Reserved’ sticker, but no one arrives to take those seats. When seated, we face a lengthy white wall lined with blank sheets of white A4 paper, the doors to the space on either side of us, acting as the wings for which performers enter and exit throughout. 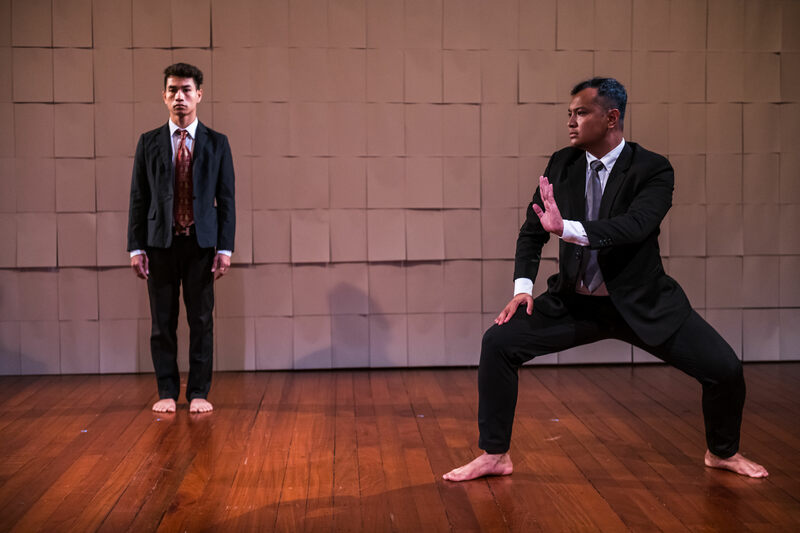 The performance begins with nothingness, as the space is left empty for several minutes, before Dizi player Andy Chia enters, donning a suit but no socks or shoes, while carrying a briefcase. 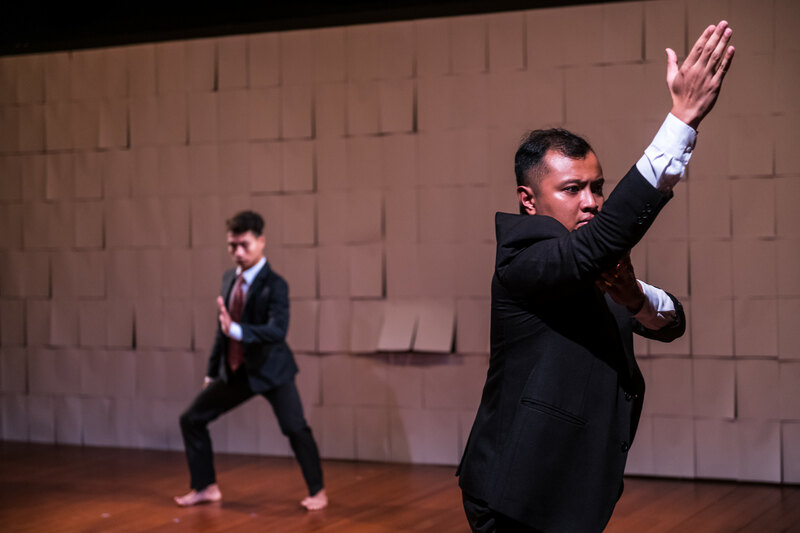 He exits, and is followed by Malay dancer Soultari Amin Farid and Cambodian masked male dancer Nget Rady, also dressed in suits, each wearing printed ties bearing emblems of their ethnicity. Liuqin player Ee Vian Loi gets up from the audience and takes a reserved seat with her, setting it down before she goes to stare blankly at the wall. 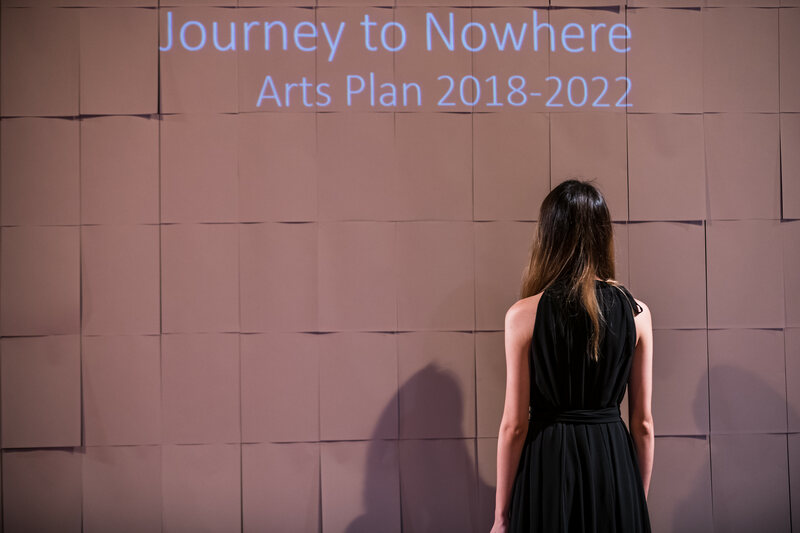 At this point, surtitles begin to appear – at first it simply the production’s title “Journey to Nowhere”, before it announces its true intent, as new surtitles “Arts Plan (2018 – 2022)” appear beneath it, as a voiceover announces the true beginning of the show. From here, Journey to Nowhere is split into three ‘chapters’, each titled after the plan’s strategic thrusts, namely: “Inspire Our Future”, “Connect Our Communities” and “Position Singapore Globally”. 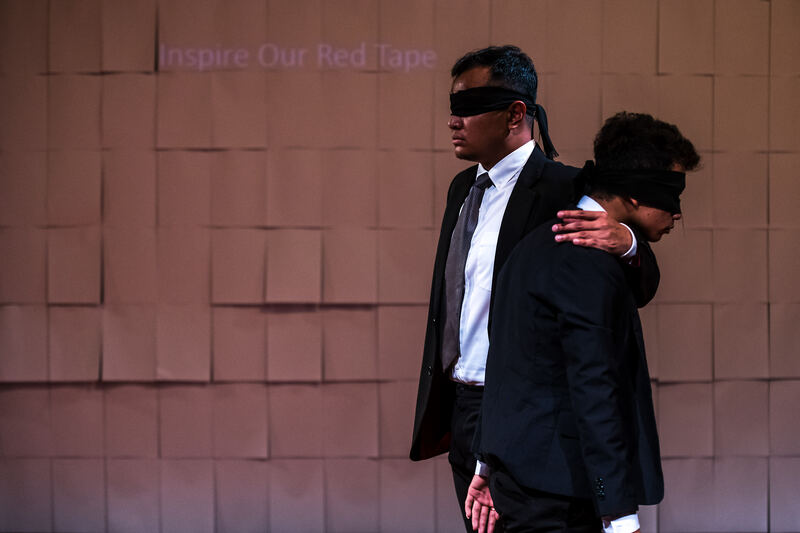 In each chapter, the surtitles begin with the original title, before replacing words to completely subvert the original’s intent and meaning, such as to “Inspire Our Red Tape” or “Position Singapore Erotically”, parodying these thrusts through both the choice of diction and elaborating through the physical performances before us, systematically taking down and satirising the Arts Plan. These come in often absurdly laugh out loud or darkly comic sequences – Chinese dancer Elizabeth Chan enters with a black cloth around covering her face while she performs, perhaps a reference to self-censorship, while Andy Chia returns later on to set up a Chinese Roomba that mills around the stage aimlessly, directly referencing the Arts Plan’s claims to increase the use of technology in the years to come. 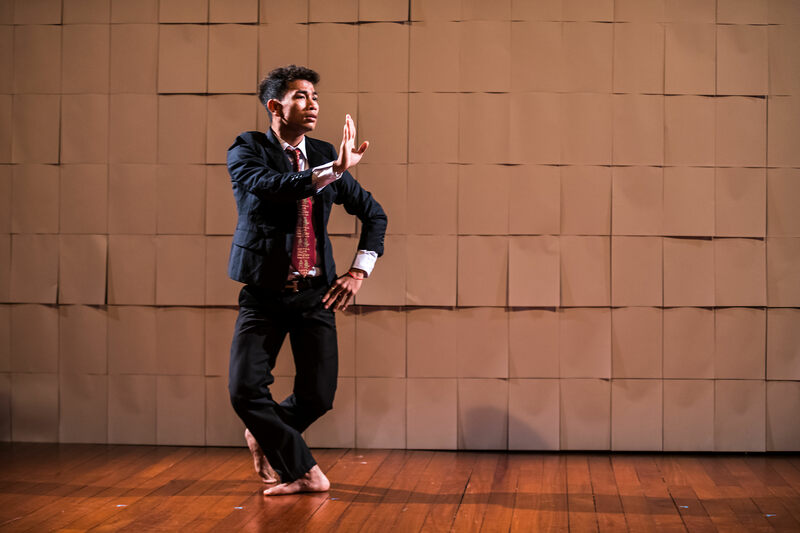 Journey to Nowhere isn’t all criticism though – in their scenes together Amin and Nget begin to dance, mirroring each other before they turn, seemingly to clash, but instead, leaning on each other for support instead. Later on, the exact same scene and sequence is repeated, only with both dancers blindfolded, emphasising the need for cooperation in the darkest of times. 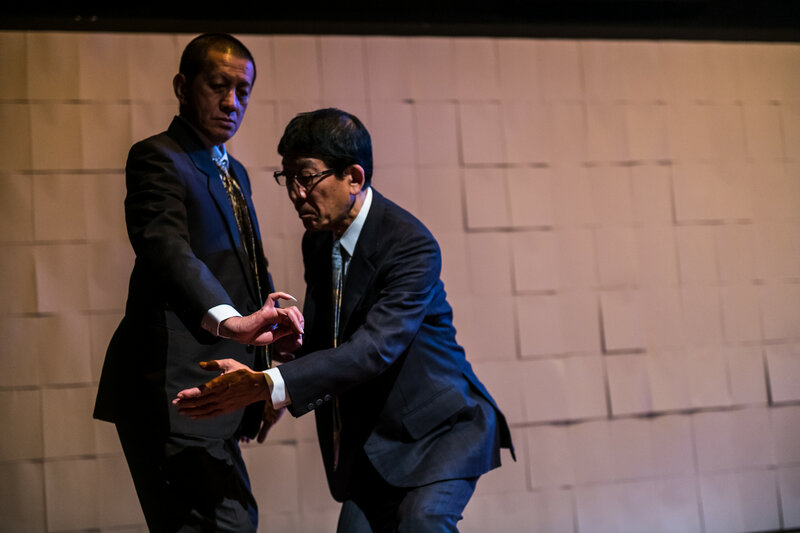 Similarly, Japanese Noh theatre expert Kanji Shimizu and Indonesian classical cross gender dancer Didik Nini Thowok come together (also dressed in suit and ethnic ties), as they use their respective art forms’ movements to navigate the stage, opening their briefcases to peer inside. They lean on each other for support, and they sit beside each other before singing a Japanese song. As far apart as their cultures are, there is a form of unspoken dialogue happening between them, melding and mixing the two art forms to birth something completely original. 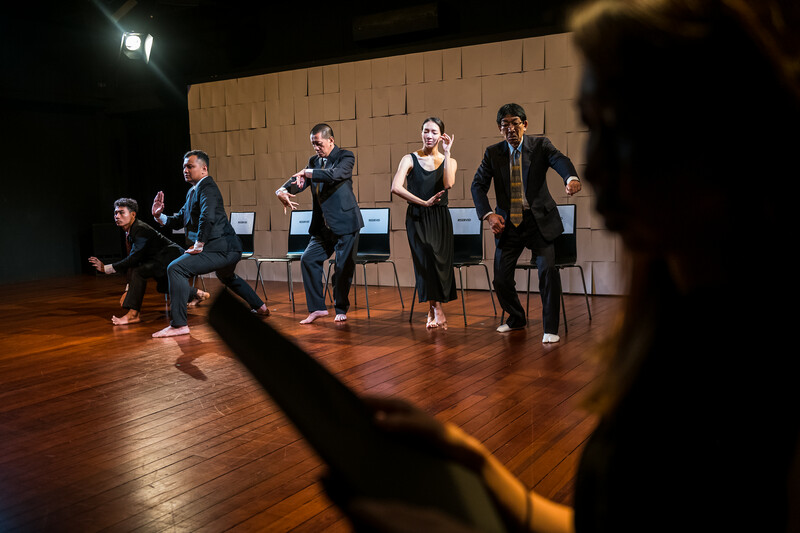 While for most of the production, Ee Vian plays an audience member observing the performance, a particularly powerful sequence in chapter 3 sees her take on the role of an interviewee, while Amin plays her interviewer. With a strained smile on her face, she explains how her liuqin is not a ‘small pipa’, yet is forced to say it for simplicity’s sake, while Amin’s character remains unmoved, unaffected and asking still more triggering questions about the popularity of her art form. 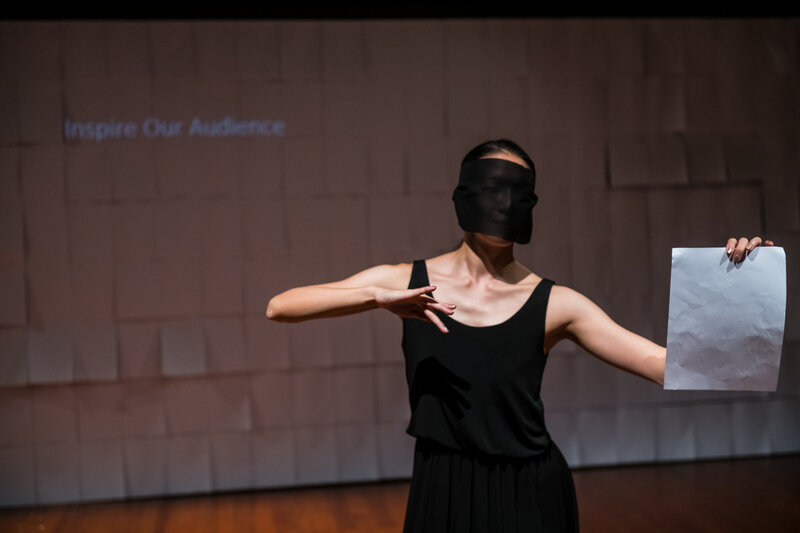 This leads her to retort with an enraged song on her liuqin, her inner frustrations turned to music as one is reminded of the often frustrating process and reasons one may have to give in seeking out artistic grants. 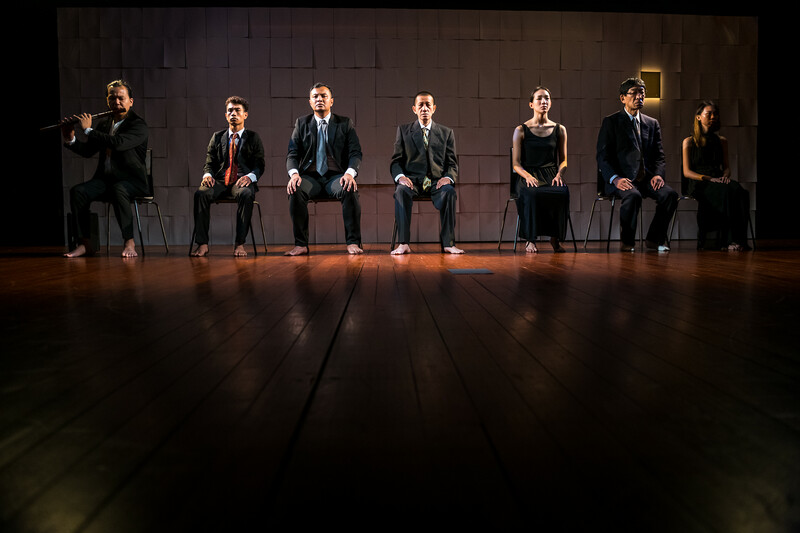 Equally powerful is towards the production’s finale, where all seven artists are in a row, performing their own art form, before Nget breaks away, suddenly transformed into a mad dog as he dashes across chairs on all fours, yelping and slamming himself again the locked doors as he fails to escape. One wonders then about the restrictions and rules certain institutions or expectations might have placed upon artists, such that they feel constrained in their creative process, unable to find alternative paths to success and trapped in a no man’s land of prescriptive, not organic art. What Journey to Nowhere does then, is not necessarily to offend – it seeks to question the easy answers and placebos that seem to have been lain out for the arts community in the years to come. It is not necessarily the Arts Plan that is a ‘journey to nowhere’, but the process of creating art itself. Often lost and without direction as individuals, knowing neither about ourselves nor the future, Journey to Nowhere becomes a call to action for artists to collaborate and chart bold new paths together, its own form a demonstration of the possibilities intercultural exchange offers to imbue the arts scene with new dynamism and ideas. In its final moments, Andy begins to play the Dizi, as a single blank spot in the wall is lighted up where Nget had ripped out a piece of paper – it’s a sign that there’s still wriggle room and loopholes for these artists to explore, no matter how small, and a tiny hope that together, something good can come out of their efforts.